Hi there! 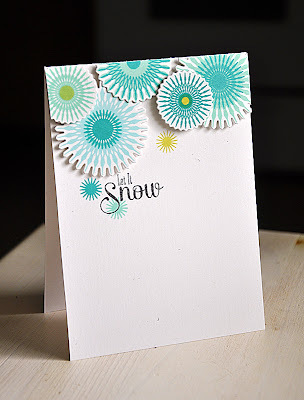 Just popping in quickly today, for day three of the Papertrey Ink countdown, to share a couple more samples using the latest addition to my Stamping Simply lineup... Snowflake Flurries. First up, layering with stamps and adhesive. Both of which add to the dimension of this simple card. 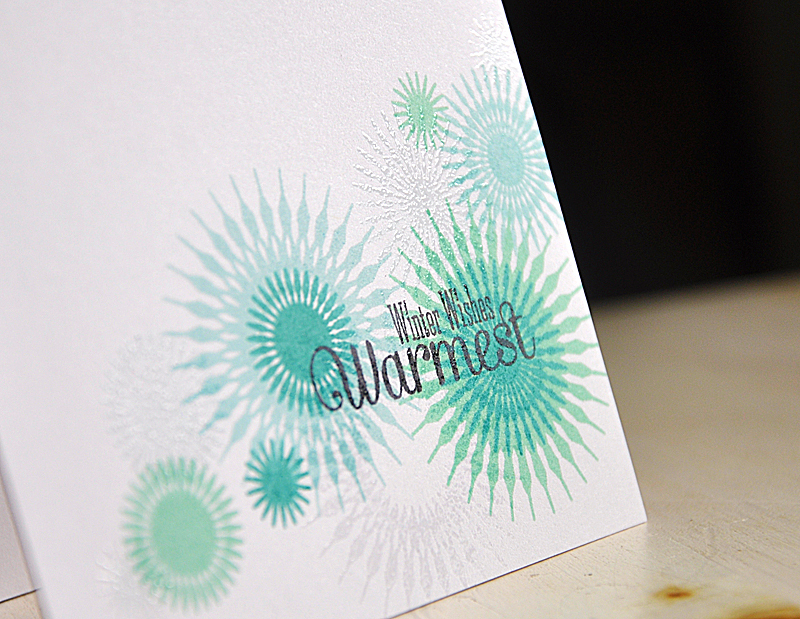 And lastly, a layering of stamping and heat embossing to create a bit of interest on this one layer card. Stamped the first layer of snowflakes in aquas & blues. No surprise there. 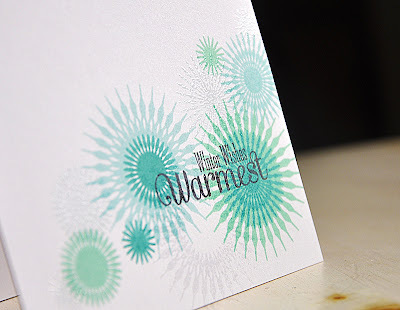 Then embossed another layer using clear embossing powder, to finished the card off. Well, that's all I've got for you today. 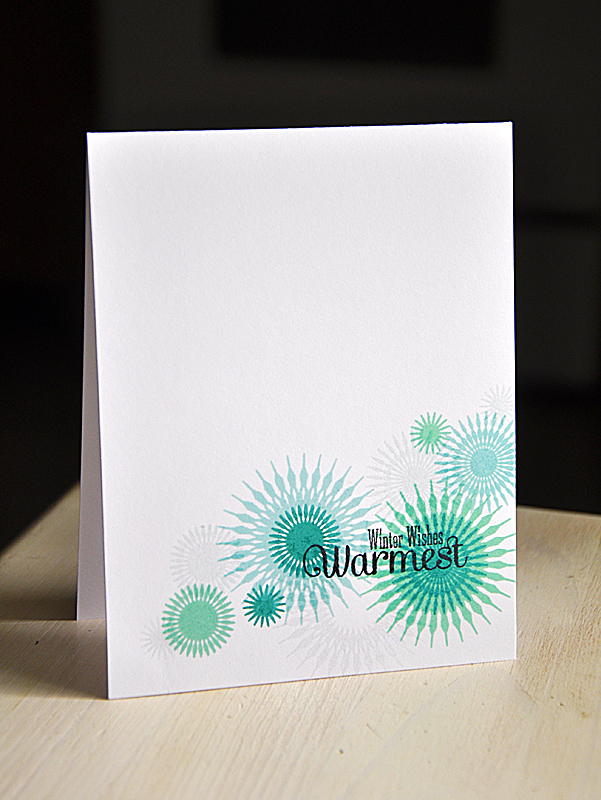 Just remember... this set is available for purchase through Papertrey Ink, beginning October 15th, for $15. In the mean time, I'd love to know what you think so far, so please feel free to share! That's it from me today. Now, be sure to visit Nichole Heady, Melissa Phillips and Ashely Cannon Newell for peeks at today's featured sets. Also, Dawn McVey, Heather Nichols, Melissa Bickford and Erin Lincoln have peeks to share with you of their newest sets for the month. So gentle and so wonderful ! Great work !!! Love this colour for the snowflakes, fabulous! absolutely STUNNING! the color combo is gorgeous and the designs are just fabulous! I can't wait to get this set! WELL DONE! These are beautiful! I love the dimension you've added to the first one! I just love your style, so clean and simple AND amazing!!! What sweet cards. I just love a project that doesn't take a whole lot of time, yet looks fabulous! Love the illusion of movement the large designs create and the sense of depth from the different color combos... so cool! Love this new set of yours. 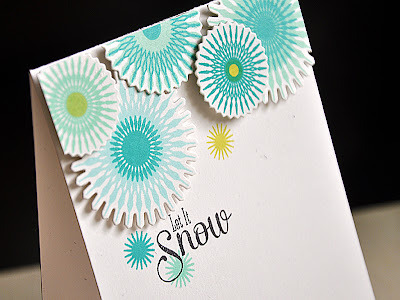 The snowflakes and the colors you are combining on your cards are gorgeous. So happy that you have a die with this set also. It looks just as good done up in one dimensional stamping too though. Just love it! I really love your color combination and the hip little snowflake set you designed. Beautiful colors and shapes. I love the dies - will be fun for layering too! At first I thought the edges were scalloped on the 2 smaller dies - now I see they are pinked - I really like that pinking detail! Thanks for creating for us. Just stunning ~ very cool snowflakes! These are amazing, gorgeous, and stunning Maile! Love them! I love the layering and design on the first one, amazing, as usual with your work :) And that 2nd card...WOW! What an amazing one-layer card!